With Spring quickly approaching, I am getting so excited about all the new clothes out! I am loving blue lately! Especially lighter blues! 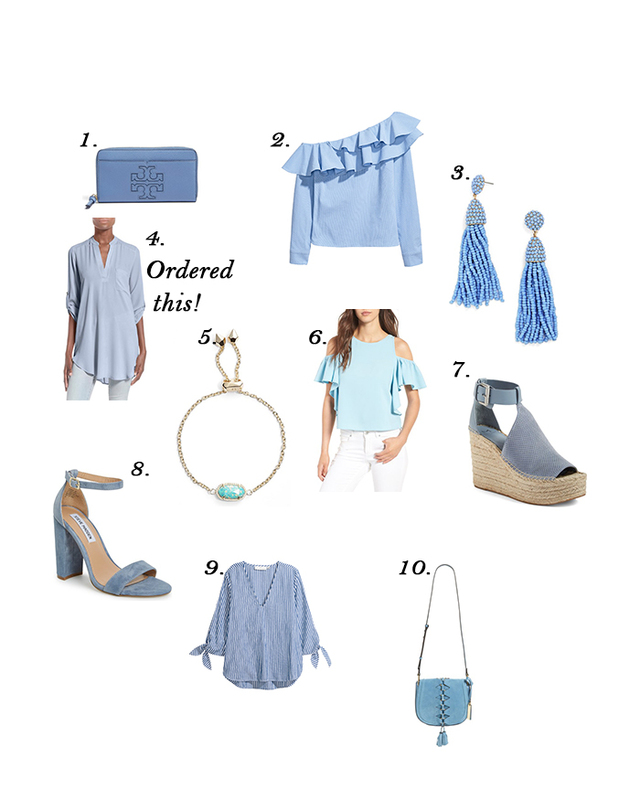 So I rounded up some pieces I'm loving right now! How cute is this wallet?! I love the large emblem on the front and how it has that large pocket on the front as well. The ruffles on this blouse are so cute and feminine! Really liking one should tops right now! I have one pair of these tassel earrings and wear them all the time! Thinking I might need them in this blue color, too! I have this exact tunic in 3 other colors and just ordered this one! If you don't have one of these tunics, you need one! This top is too cute! I love the color! I am obsessed with the shoes! They would be adorable with a white dress in the summer! This Steve Madden 'Carrson' Sandal is super popular! I can see why! They are super cute and come in so many colors! Love blue & white stripes! The little tie detail on the sleeves is a really cute touch! Isn't this bag gorgeous!? It comes in a few other colors, too! P.S. I literally just figured out how to use photoshop! I have had the software on my computer for a long time now but could never figure out how to use it! It is so confusing! With the help of a couple YouTube videos I finally got together this collage. Its not perfect, but it's a start!